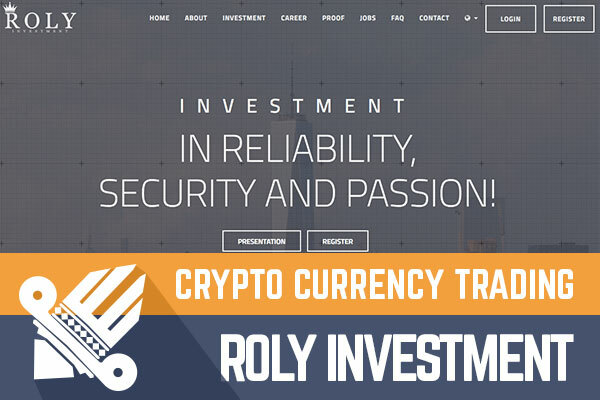 A new project called Roly Investment has joined DavidNews.com Golden Stage on the 22nd of June. In case you haven’t opened the website yet, I can tell you that it’s another HYIP, which is accepting Bitcoin only deposits. Now I have reinvested into Roly Investment $400 worth Bitcoin, to track the performance of the project for you. In fact, Bitcoin price is changing and the amount of the reinvestment has already changed during the past 5 days. However, keep reading and find out more about the main topic of this review – Roly Investment. I’m always looking for some detail of every HYIP, which makes it different from many previous programs. At first glance, I noticed the logotype, which gives me a strong feeling that the admin is trying to relate this HYIP to Rolex. Of course, you will say it’s only the letter “R” with a crown. In my opinion, it has a very strong symbolic meaning, which is well known in most of the countries of the planet Earth. Second, there are 20 different language flags at the bottom of the page. It would be interesting to find out the reason why there is a set of these 20 languages. I would like to ask you to drop a message and tell us if the translations are automatically translated by Google or not in case you are a native speaker in any of these languages. It would be interesting to it find out. Roly Investment positions itself as a community of retired former hedge fund banks that have over 17 years of experience on Wall Street. The team behind Roly Investment consists of 10 members who are retired traders. If you watch the video, you will notice how Roly Investment has been described - an elite club, a neural network and so on. From such epithets, I assume that there has been a creative writer involved while writing a legend for this HYIP. Of course, it has nothing to do with the performance of this HYIP in following days, weeks or months. However, the legend is one of the things, which a potential investor reads, to find out if there are any odd facts mentioned in it. Of course, for me, it sounds odd that successful hedge fund workers decided to invest in cryptocurrencies. I mean, why should successful hedge fund brokers invest money in something, which was a mystery at that time? Yes, cryptocurrencies become the big thing at a certain point, but I don’t believe that in 2007 it was easy to convince people to invest in Bitcoin. 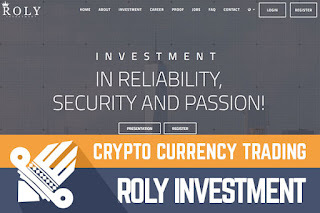 If you checked the investment plans of Roly Investment, then you probably noticed the “Insurance” switch, which offers you to see different interest rate for investment with and without “Insurance”. It’s a feature, which is activated by default after making a deposit. The insurance costs 5%, but the investor can also deactivate it. Unfortunately, I found only one sentence, where admin claims that If Roly Investment is unprofitable over the course of one week, your deposit will be protected with insurance and will not have to worry about it! The only conclusion I made here is that I must worry about the deposit if insurance is not activated. Roly Investment offers 3 different investment plans with floating interest rates based on the amount of deposit. I believe that most of the investors will make deposits, which are in the range 0.01-0.99 Bitcoin – a plan called Standard. For example, investment of 0.082 BTC with a monthly yield of 16-20% (insurance on) would make a monthly profit of 0.016400. Unfortunately, this time I must stick to calculations provided by investment plan calculator because there are too many unpredictable elements in this HYIP. First, the monthly rate is floating. Second, it’s not clear if a deposit is part of the total profit and monthly profit. Third, 80% of deposit is returned at the end of the investment, which means - after 365 days. In case you decide to invest, I recommend checking average monthly interest rate and do your own calculations to understand when your deposit has reached the break-even point and how much you make a month and how many months it takes to start earning. I recommend it because 365 days is a very long term for an HYIP investment and many things can happen over the time. To sum up, everything I wrote earlier for those readers who like to get the essence of this review. First, it’s comparably new project, which is positioning itself as a long-term project (investment cycle of 365 days). Second, Roly Investment accepts only Bitcoin deposits. Third, there is a lack explanation for the investment plan insurance. In fact, the interest rate in the investment plan calculator is higher when you choose not to have an insurance for your deposit. Fourth, I have a feeling that admin is trying to do everything, to deceive us. Insurance, floating interest rates, a partial return of deposit at the end of the cycle. It all makes the calculation of the real profit very complicated. As usual, only the time will show if there is any future for this HYIP. Therefore, if you ever decide to make any investments, don’t invest more than you can afford to lose! Investment plans: 21% up to 35% monthly for a year. Payments on Monday, Wednesday and Friday. 80% initial deposit returned at the end of the investment term.